It has long been known that modern-day birds are the living descendants of the dinosaurs. During the past few years, many new feathered dinosaurs have been discovered, revealing that the relationship was far more widespread than previously thought. 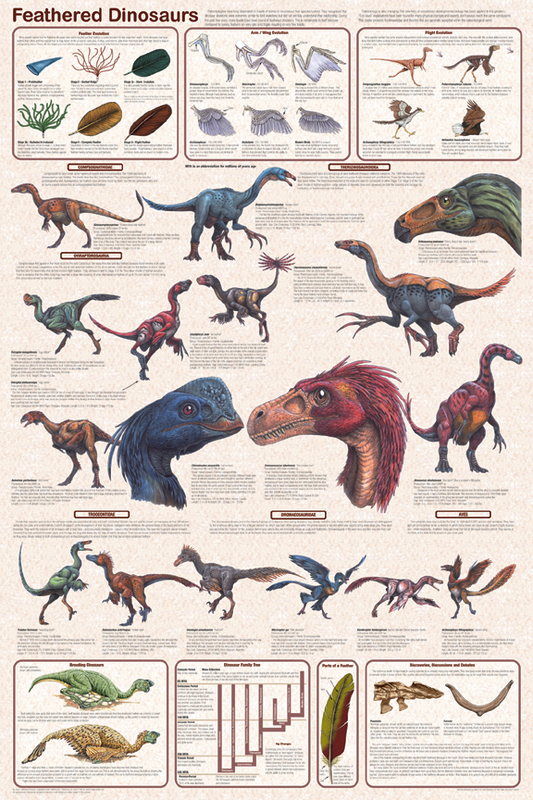 Highly detailed illustrations clearly show the differences in 17 species. Captions cite name, pronunciation, when they lived, localities where found, size and interesting facts. Insets explore: Feather Evolution, Wing Evolution, Fight Evolution, Brooding Dinosaurs, Dinosaur Family Tree, Parts of a Feather and "Discoveries, Discussion and Debates." Loaded with fascinating facts.